After a rocky start, we managed to get on the road last night and made some progress north and then checked into a motel. With a fresh start in the morning we progressed through central California and then into Oakland, before crossing the bay into San Raphel to catch the 101. As with most of our trips, we front-loaded the driving on the first day. 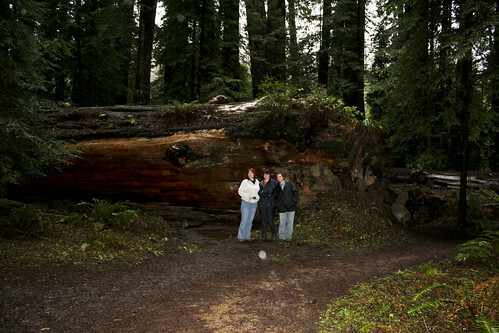 Our goal was to get up to the Redwood Forest with enough daylight left to be able to enjoy them. Mother Nature decided to dampen our plans, literally, but we did still manage to get a good look at some mighty redwoods along The Avenue of the Giants. The clouds hung over the mountains, dropping sporadic showers on us as we traveled. The dark sky and drops of rain did not deter me from trying to take some pictures! Late in the afternoon, we stopped as a shower broke a bit and walked amongst the giants – and even encountered a couple of deer! 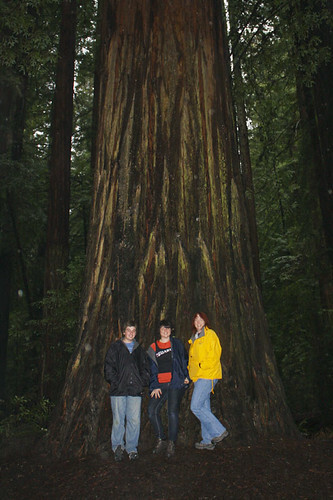 With a cloudy sky and progressively fading daylight, I snapped one more picture of the gang to help show the scale of these mighty redwoods. Are we done giggling yet? Our adventure in the redwoods isn’t over just yet. We’re staying in a cute little cabin at the Emerald Forest of Trinidad (they even offer free Wi-Fi! 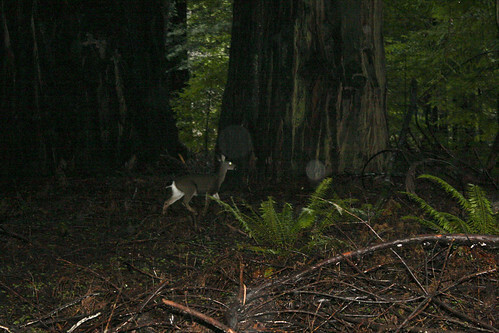 ), with a good chunk of the redwood forest left to explore! Hopefully the weather will be a little better for pictures tomorrow. Check out the trip photo set. This entry likes to wander the forest primeval. This entry was posted on Saturday, February 14th, 2009 at 10:48 pmand is filed under . You can follow any responses to this entry through the RSS 2.0 feed. You can leave a response, or trackback from your own site.